Here are 2 great pumpkin dishes that are delicious ways to make use of your Halloween pumpkin. Try pumpkin risotto and then with your leftovers, fry up some pumpkin arancini! After you have cut the pancetta into thin, short strips, heat up a fry pan with EVOO and add them in. Let this cook on a medium heat for around ten minutes or until they begin to caramelize and become crispy. Heat up another fry pan and add EVOO and a couple of small branches of rosemary. When the aroma becomes really strong, remove the rosemary and add the onion and sage leaves. Let this simmer on a medium heat until it begins to brown. Add the pumpkin to the pan and mix it around with the onion for around 2-3 minutes. Then, using a ladle, spoon 2 – 4 scoops of stock and mix well. Let this simmer for 10-15 minutes, or until the pumpkin becomes nice and mushy. Squash the pumpkin down a little more using a wooden spoon then grate some fresh parmesan cheese over the top and mix again. Once this is ready, add the rice and stir it through. Then, begin to ladle the stock in and mix simultaneously. As the liquid disappears, you need to continue to add stock and then stir it through. This process will take around 25 minutes in total. 2. Moisten your hands with water and pick up a handful of risotto. Flatten it into the palm of one hand, curving it slightly. 3. Put some cheese into the centre, both provolone and mozzarella, pressing it down a little. 4. Moisten your hand again using the bowl of water and add more risotto on top, covering the cheese and make the mix into a ball. 5. Cup your hands around it making it into a ball and moving it around to make sure it is well rounded and that the ingredients in the middle are well covered. 6. Pour a generous amount of vegetable oil into a pot or deep fryer and put it on the stove at a medium heat. 7. Dip the pumpkin rice ball into the egg making sure it is really well coated before dropping it into the breadcrumbs and rolling it around to completely cover it again. 8. Place it on a flat plate with paper towelling at the bottom so the excess crumbs fall off. 9. 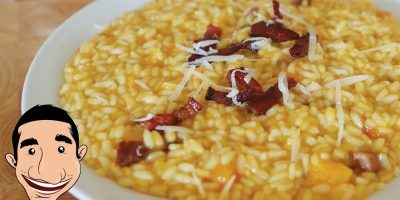 Repeat 2-6 unti you have used up all of your leftover risotto.